Just made these awesome little goodies for some Christmas treats for my girls. 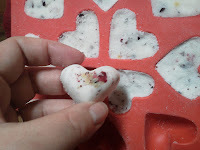 Made with citric acid, baking soda, corn starch, grapeseed oil, specked with dried rose petals and oatmeal, and fragrance oil from Brambleberry called almond biscotti, (totally yummy warm scent, love it) and spritzed with a little water to get it to harden, they fizzle away in your tub as your stress and weariness fizzles right away! Put baking soda, citric acid, corn starch and bits of rose petal (optional) in a bowl. Mix well. I used a small strainer to get it a finer mixture. well. This helps it to harden, it will fizzle slightly. NOT too much water here girls! them out. 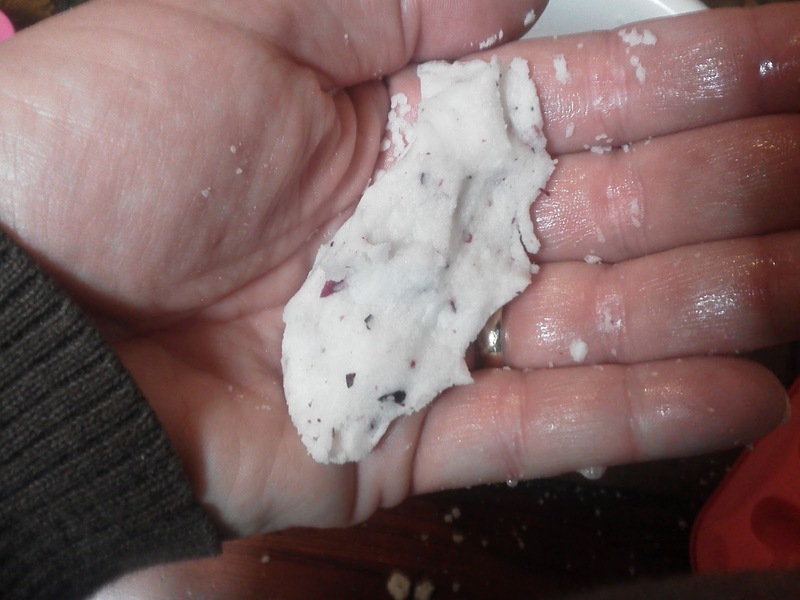 Or just mold into a ball by hand and let dry. 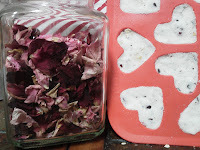 NOTE: I tried spritzing with witchazel and with alcohol as I use in my bath fizzy bomb recipes that do not have oil in them, and it did not work, they didn't harden. 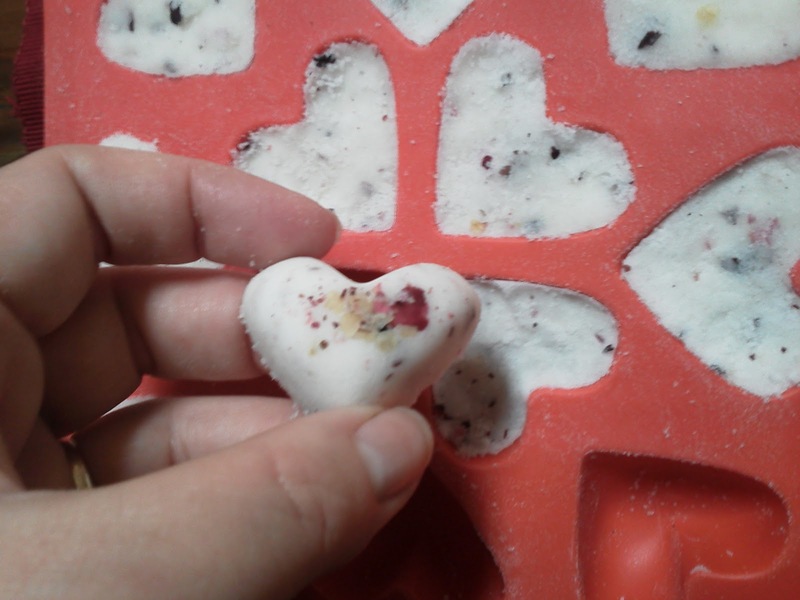 This makes a lovely bath oil melt. Soothing and soft. Luxurious and pampering for your skin. 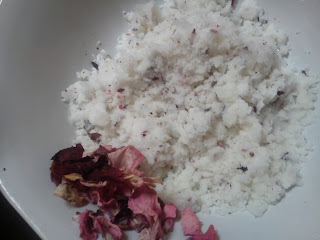 This is the mixture with all ingredients after I spritzed with water and mixed well. Put it in your palm and squeeze. If it holds together like this, it is ready to go in mold. Mine would not harden without that spritz of water. I had left them in the mold overnight, and they were still oily and not hardening. 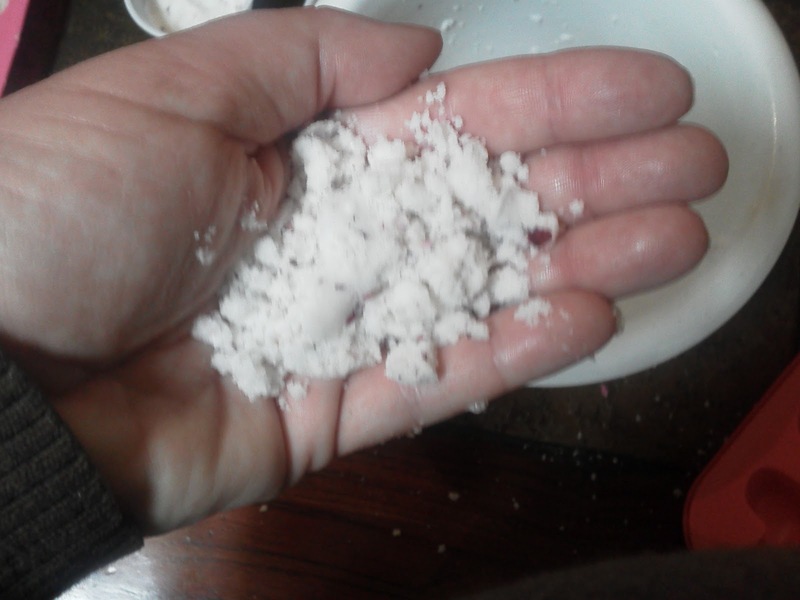 I took them out of the mold, put them in a bowl, crumbled and spritzed with water. I then re-molded them and let them sit over night and they were hard as a rock. These look really cool Anna! I bet the girls will love them! Great job! 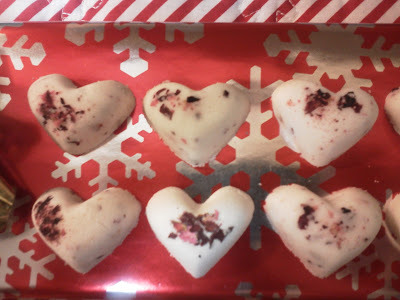 These look wonderful Anna, I hope you get to enjoy some too! Hi Anna, deine Melts sehen wunderschön aus. Danke für das Tutorial. Doreen, thanks! they were fun to make too! I gave them as Christmas gifts to my daughters and neices. Anna- do you know if you can substitute arrowroot for the cornstarch and olive oil or coconut oil for the grapeseed oil? Joyfulmom, sorry I forgot to address the arrowroot question. I've not used it yet but it is used in natural cosmetics. I have done some research on it for a dusting powder recipe I'm working on and it sounds like it could be substituted for cornstarch, with the equivalent of 2 tsp arrowroot = 1 TBL cornstarch in this recipe. Like I said, I really don't know how the finished product would come out because it is a different texture, etc. and I haven't tried it.